Get your Google Business Listing to the top ranking. We can help create, optimise and rank your Google Business Listing to drive more traffic to your website. What is a Google Maps Business Listing? It is a Google business listing in your local area. For example, if you search for a restaurant, restaurants closest to your location will show on Google with a map. The listing shows the top 3 local businesses based on your search. To browse more of the related listings, you then need to click on the More places link. If your business doesn’t show in the top 3 listings, you’re losing a lot of potential customers. The Google Maps Business listings now dominate most of the pages on Google. A lot of businesses don’t have a free Google Maps Business listing because they don’t either know about it or have no knowledge how to setup one. You can either Google it or search it on YouTube to find out how to setup a Google Business Listing yourself. Although it’s not hard to do, if it’s not done properly, you’ll be missing out on a lot of potential customers. 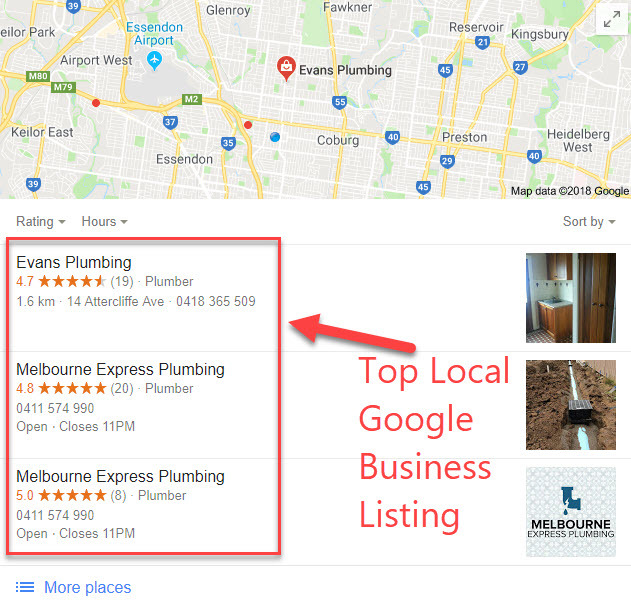 Boost Your Local Seo in Melbourne! We have the expertise to setup and optimise your Google Business Listing properly. Not only that, but we can also help you rank your Google Map Business Listing so that your business shows up in the top 3 listings nearest to your location or area. The other important thing to note, if your business address is not consistent on other websites such as directories, social media sites, etc, then Google will get confused. Your business address needs to be consistent. The address on your Google Business Listing needs to match on every website that references your business. Even minor differences such as abbreviations will affect your rankings. To go through every site that lists your business contact details and to make sure they are all consistent can get very tedious, be a lot of work and time consuming. We take that stress away from you and do the tedious task ourselves so that you can focus on making money with your business instead. To summarise what we do to get you more visitors through local Google searches, we basically create and setup your Google Maps Business Listing. If you already have an existing listing, then we make sure it’s setup properly and optimised. We make sure that all your contact details throughout the web are consistent and we build your citations to strengthen your rankings. Citations are basically your business listings such as Yelp, Yellow Pages Directory, social media sites, etc. We can even use press releases to get you more citations. Other factors that can help are business reviews and posts made to your business Google listing. We cover all of that too.